Someone saw The First Power a couple decades back and thought “Gee if you throw a ‘Name’ actor in the mix and some hooky stuff and you’ve got a hit!”. 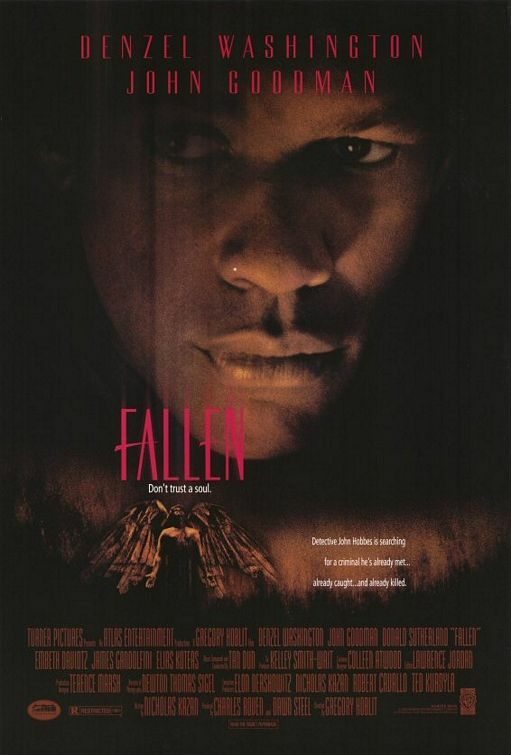 Well not so fast Chief, I’m not sure how profitable Fallen was but at least it is a pretty good serial killer flick with distinct supernatural and theological undertones. Detective John Hobbes (Denzel Washington) inhabits the Lou Diamond Phillips role. He too is an expert in identifying and tracking down serial killers, he too is celebrating a great ‘get’ in the form of Reese (Elias Koteas), an especially heinous individual who took great delight in taunting his pursuers, often calling Hobbes at home just as a tease. Even in captivity Reese is still cocky and brash, citing using obscure references harking back to eras long since past to bait and bait Hobbes in foreign tongues… all the way up until his execution. Well that’s that then. Not really. Shortly after the execution a new killer appears, one that seems to be mimicking Reeses’ modus operandi all the way down to the late night phone calls to Hobbes’ home that he shared with his brother and nephew. Hobbes and his detective colleagues Jones (John Goodman) and Lou (James Gandolfini) jump on the case, with Stanton (Donald Sutherland) overseeing the precinct. Hobbes follows the trail closely, all the way back to a murder case over thirty years old with startling parallels to the present day. This leads him to Greta (Embeth Davitz) the daughter of a cop implicated in the old case, who warns Hobbes off the entire thing, telling him to stay away for the benefit of his family and everyone he knows. Which is where the supernatural elements kick in, elements that I have deliberately not mentioned here as half the fun is in discovering them. Denzel is solid as always in the central role, remaining stoic and professional even in the face of mounting evidence that he is facing a foe that is decidedly ‘other’. The supporting cast are all fine in their roles – Koteas standing out in a role that demands he play things over the top – and even as the situation grows tighter and more desperate the filmmakers manage to keep the tone straight and as realistic as the plotline allows. 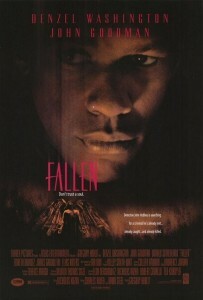 I liked Fallen, it was very effective in building tension in a few early sequences as the truth is gradually drip fed to you, and the finale was quite good, especially considering that the film began to lose steam in the second third of the film. Was it necessary to make practically the same film as The First Power only with a bigger budget and Denzel to lend credibility and box office clout? No. Is it better or more memorable than The First Power? Not really. Is it worth a look? Yep. Especially if you were one of the few who actually liked The First Power. If you’ve never heard of it and liked this, look it up. Final Rating – 7.5 / 10. Touchy feely strangers singing Rolling Stones songs would be strange and disturbing if you weren’t in the midst of a murder case. Here they just cap things off. This entry was posted in Denzel, Film, Movie Reviews, Worthwhile Movies. Bookmark the permalink.